A beautiful new arts center opened in the heart of White River Junction’s downtown in 2015. The Barrette Center for the Arts houses an intimate 240 seat modified thrust performance space and has all the technical capabilities you would hope for. 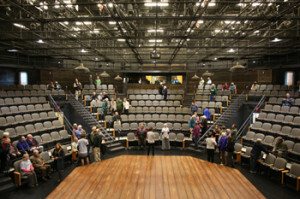 The backstage supports large and small cast productions with rehearsal space matched to the size of the stage used in performance. The lobby is fronted by an outdoor plaza and is enclosed by an inviting windowed street front. 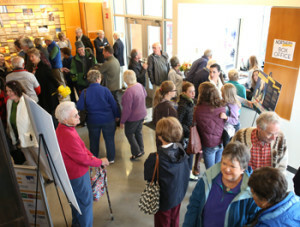 The building and spaces within the building have been designed to meet accessibility needs — including an assisted listening system in the theater itself. 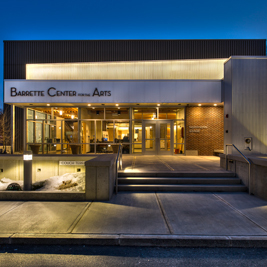 Managing Director Eric Bunge reported, “People tell us the Barrette Center for the Arts is their favorite place to see live theater. We couldn’t ask for a better testimonial.” Then, he told us more. Arts Council: New spaces don’t just show up. What were the unseen efforts in the creation of the Barrette over time? How did the organizers know this was a “Go!” in White River Junction? Eric: Many hands make for light work! The unseen efforts and the numbers of people involved in making the Barrette Center for the Arts a reality are too many to list. The notion of a new theater or performing arts center for Northern Stage in White River Junction had been around since the early 2000s. Timing and touch are everything. Vision, leadership, and demonstrated impact are paramount to the success of any endeavor. It took the right people at the right time with the right vision in order for our board of directors, our patrons, and our community to believe this could happen. Once we all believed it could really happen nothing could stop it from happening. Arts Council: What is going on now that lets you know this is a success? Eric: Of course, the easy answer would point to the numbers. We have seen an incredible increase in annual attendance and an increase in our programmatic output. Our annual budget has nearly doubled and we are getting closer and closer to break-even on an annual basis. Our new play development efforts have resulted in national attention including off-Broadway and regional theater productions. Our education programs are impacting more and more students and school districts. Commercial real estate development in the area has mushroomed. The surge in our local creative/cultural economy has inspired private developers in ways that I don’t think our community has seen in many, many years. These are all quantifiable. All you have to do is come to White River Junction and look around downtown to know that things are really happening. But what tells us more, what speaks louder to our success, is what people say about Northern Stage when we’re not in the room and then we hear about it “by the by.” We hear that people are saying “Northern Stage walks its talk … it exists to do good in and for the community … to build and bind our community in ways that only a theater company dedicated to changing lives one story at a time can do.” We are humbled and inspired by these reports. Arts Council: There are a number of new arts facilities in Vermont. What’s your take? Eric: I could just say “the whole world’s gone crazy,” but really the answer is that the need for new performance spaces in different parts of our state or region is not new. Many performing arts organizations have been dealing with this for many years. Success in one part of a state or region can inspire success in other parts of a state or region. Also, the markets have been good to people in the last five years or so so there is an increased capacity to fundraise to pay for these new buildings. Our hope is that the Barrette Center for the Arts and the other new performance venues in our state will serve as a gathering place for people to see live performances for a long, long time. Arts Council: Are you aware of any synergy between the organizations? If not, should there be? Do you have ideas for building it? Eric: Northern Stage Company and members of our staff have been involved in small — and sometimes not so small — ways in service to other arts building projects that have happened in our region or are in the planning stages. We are very open to exploring the ways in which our experience and expertise can benefit our arts partners locally, statewide, or in the broader multi-state region. In many ways this activity can take on a life of its own and we have to be very careful not to stray too far away from our core mission in our primary service area. Arts Council: If you had to offer a piece of advice for organizations considering building, what would it be? Eric: Seek the advice and counsel of an organization and the people who have gone through the process already and learn as much as you can from them. Remember, you are not the first person or first organization to do this but if you’ve never done it before you can learn a lot from those who have. Passion, perseverance, patience, and proper planning overcome all obstacles. Northern Stage is one the Council’s twenty-seven Arts Partners.